Steel-Body pigs, or Mandrel pigs, are heavy-duty pigs which can be configured in a number of ways to provide maximum cleaning, sealing and sweeping power. 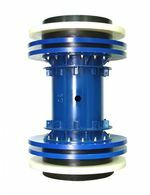 These pigs can travel long distances and the urethane cups and discs are replaceable which makes them an economical option for many pipeline operators. The standard HZ pig consists of a steel body with the brushes mounted on cantilever style leaf springs and (2) neoprene or polyurethane cups. 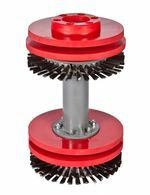 This aggressive brush pig can be fitted with cups, discs or cup/disc combinations, gauging plate, transmitter, magnets and ring brushes. 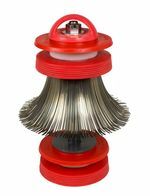 The brush bristles are available in carbon steel, stainless steel and prostran. The steel bristles are available in flat or round wire or substituted with pencil brushes. These steel-bodied scraper pigs are outfitted with neoprene discs instead of urethane. Neoprene has certain qualities and advantages over urethane. Although not as wear-resistant, neoprene generally has a longer shelf-life than urethane and will not crack or get brittle with exposure to the sun. This makes neoprene ideal if you have short pig runs and wish to re-use the pig over the next 3-4 years. Standard with polyurethane cups. The wire wheel brushes are excellent at removing paraffin wax build-up. GBC Cup pigs are for unidirectional operation. For batching, displacement, hydrostatic testing and paraffin removal. Standard with polyurethane cups. * For gauging, add aluminum or steel gauging plates. Pig transmitter mounting optional for larger diameter pigs. GBC pigs have a Center Hole Configuration up to 16" and a bolt hole pattern for sizes larger than 16". 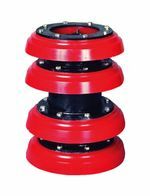 The Enduro Dual-Diameter Pigs are designed to withstand the heavier wear due to multi-dimensional pipe. This pig provides cleaning action and has proven to hold a great seal through multi-diameter lines. Design may be varied to specific line needs; i.e. bend radius requirement, valve bowl lengths etc. 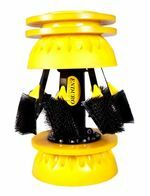 and can also be outfitted with brushes specially designed for multi-diameter cleaning. A versatile pig available with various cup and disc configurations. The metal pig is useful for cleaning, batching, purging, and paraffin removal. Enduro's pig train employs the Pig Link concept which allows various configurations and adaptations of cups, discs, and body links. The flexibility of the polyurethane body link allows the pig to pass bend radius as small as one diameter even when attached to additional link sections. 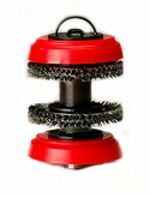 Pencil Brush Cleaning Pigs are heavy duty, aggressive cleaning pigs equipped with a steel body, spring steel wire brushes and polyurethane bumpers and discs. 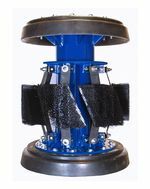 TDW's PitBoss™ Cleaning Pig is designed to remove soft to medium-hard deposits from internal pits while also serving as an excellent general purpose cleaning pig. 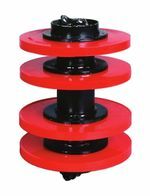 WCK Pigs come equipped with tempered steel wire brushes and urethane cups. The dual diameter WCK Pigs for cleaning multiple sizes of pipe are equipped with steel wire brushes and discs. An outlet port at the front end of the WCK Pigs provides fluid bypass to prevent piling of loosened material. 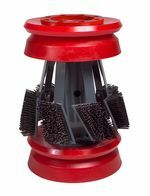 VANTAGE® V Cleaning Pigs are multi-use pigs equipped with either scraper discs/cups, cups, brushes or blade cleaning elements. The VANTAGE® V is offered in eight different cleaning configurations. All cups and discs are replaceable and can be interchanged or reconfigured.